A lot of branches and trees fell in Essex County due to the Nor'Easter that slammed the tri-state Wednesday. Chris Glorioso reports. First came a nor'easter. Then the clean up. And now, repeat. For the second time in less than a week, a nor'easter wreaked havoc on the tri-state -- this time dumping more than two feet of snow on parts of the area, grounding more than 1,900 flights, stranding commuters on the roads and rails and bringing yet another round of damage and power outages to towns still recovering from a previous storm. Winds generated sustained speeds between 30 to 40 mph, toppling trees and taking down power lines. Although the storm was not predicted to be as severe as the nor'easter last Friday, it still proved to be a headache for the tens of thousands of customers still in the dark from the earlier storm - and for the crews trying to restore power to them. Hundreds of thousands of customers from across the tri-state were without power early Thursday as the storm rolled through the region with heavy, wet snow falling amid flashes of lightning -- also known as "thundersnow" -- and increasingly powerful winds. As of Friday morning, more than 100,000 thounsands remained in the dark and the cold. 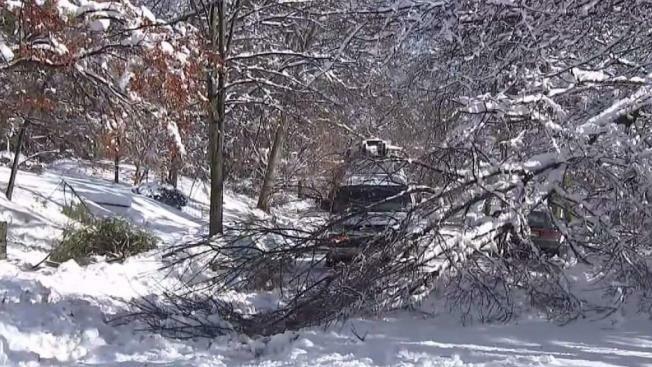 Thousands of customers in Westchester County have been living in the dark for days and the second storm just added to the misery. Ray Villeda reports. Conditions didn't improve outside, either. Montville, New Jersey, saw the most powder fall with 26.8 inches of the white stuff on the ground. 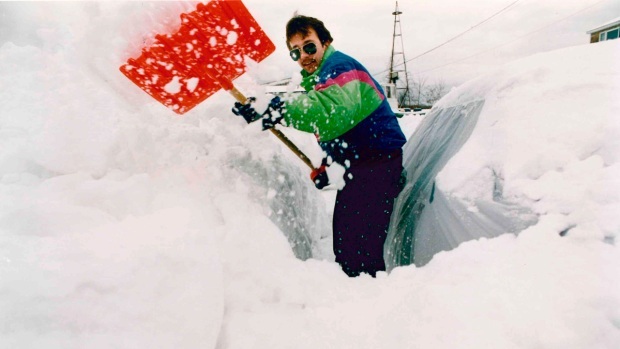 Sloatsburg saw the most in New York with an even 26 inches. Several other towns in northern New Jersey and the Hudson Valley also saw more than 20 inches of snow. In the five boroughs, meanwhile, the snowfall made much less of an impact. Central Park only recorded 2.5 inches, while Little Neck, Queens, saw the city's highest total with 4.7 inches. Click here for snow totals around the tri-state. The storm made traveling treacherous. 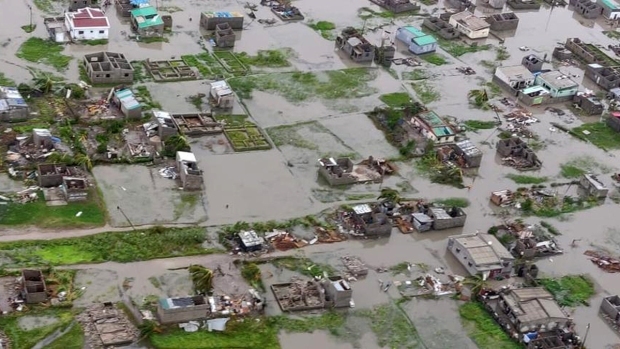 Some of the workers who dared venture into the city for work earlier in the day only found many of the region's roadways at a near-standstill and the normally myriad mass transit options halted. Thousands of flights across the region were canceled. It was not much better on the ground. Amtrak suspended service between New York City and Boston Wednesday evening, and resumed by 11 a.m. Thursday. Service on all three Metro-North lines that depart from Grand Central Terminal were suspended Wednesday and suspensions on other lines lingered into Thursday. The railroad operated on a reduced schedule with certain branches suspended until further notice. Delays and crowded conditions were expected. Multiple NJ Transit lines and Long Island Rail Road branches also reported suspensions and delays. LIRR was back to normal Thursday morning, but NJT was still reporting some suspensions on several lines. The roadways, likewise, were inundated by the snow. Check the latest transit info here. New York City public schools were open Wednesday and Thursday, but hundreds shut down Wednesday and more than 200 were closed or delayed Thursday as well. Check school closings here. Most winter storm warnings expired early Thursday. The skies cleared up Thursday and Friday, leading to a high of 46, which could lead to a slushy, melting mess for many before refreezing at night again. The weekend and following workweek both look to be seasonable. Last Friday's nor'easter left the tri-state reeling for days, halting transit and leaving hundreds of thousands of people without power. The Garden State bore a significant number of power outages from last week's storm, and New Jersey Gov. Phil Murphy declared a statewide state of emergency for Wednesday; state offices were closed. There will be a two-hour delayed opening for those offices on Thursday, Murphy said. 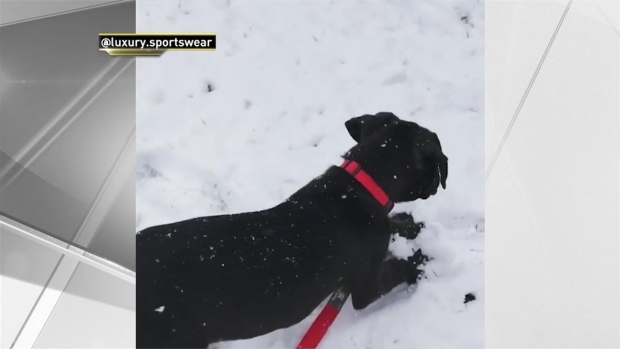 It's this puppy's first time playing in the snow, and for some reason he just can't catch it in his paws. Jet, 11-months-old, was recently adopted by his owners from Poor Paws Rescue. He now lives in Wayne, New Jersey.